The predominant breeds in creating an American Nigora Goat are the Nigerian Dwarf and Angora goat (white or colored) from which the breed takes its name. 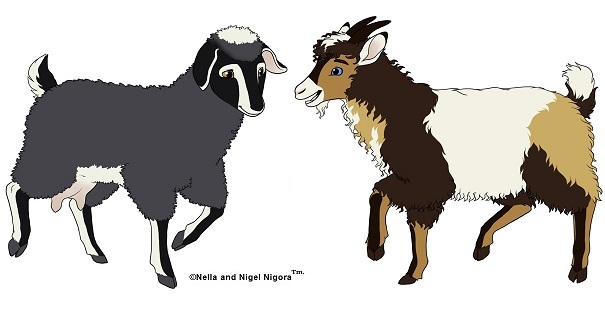 A Nigora may also be created by crossing Swiss-type Mini Dairy Goats (which were founded from Nigerians x Standard dairy breeds) on Angoras. Grade Nigoras are also allowed (see below). 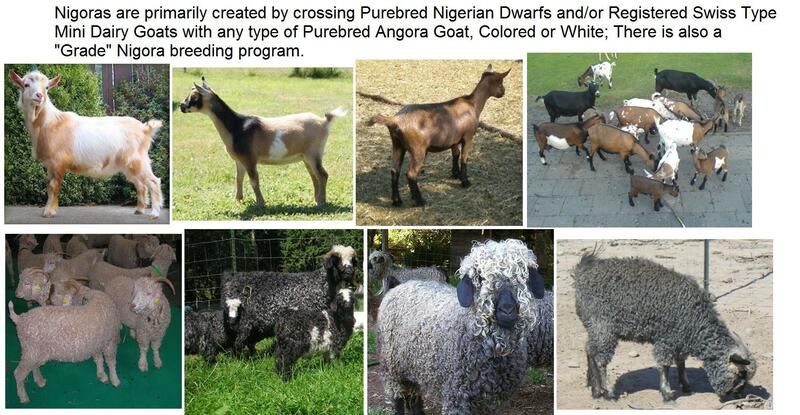 Alternate breed crosses used to create American Nigoras include PBA Pygoras©, Caporas (formerly known as PCA goats) or true Cashgoras (Australian and/or American Cashmere goats x Angora)--all of preferably of 75% or more Angora breeding-- crossed back to Nigerian Dwarfs, or to "Swiss type" Mini dairy goats of 50% or more Nigerian breeding, or to F-gen Nigoras from purebred foundation breeding stock. 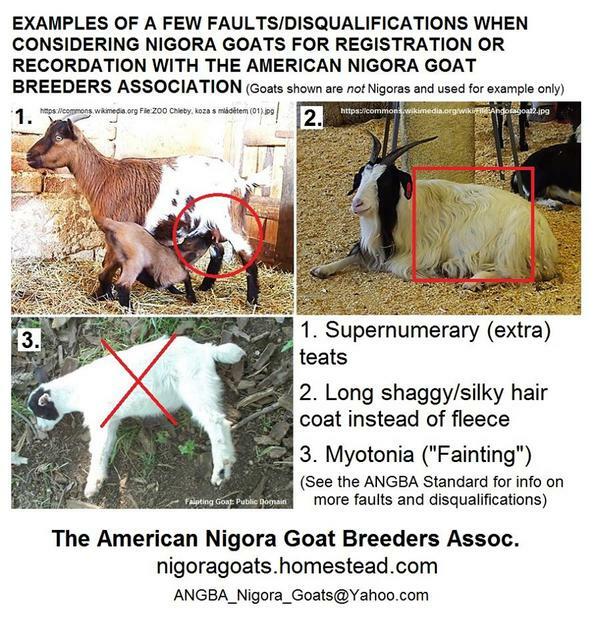 Goats of unknown or uncertain breeding, which have no serious faults/defects and fit the American Nigora standard/ideal, will for all intents and purposes be considered a Nigora (Grade) and may be used in a Nigora breeding program. "Heavy Nigora": A Nigora which contains a greater proportion of Angora to Nigerian or Mini-Dairy breeding (should ideally not be more than 75% Angora to non-fiber goat breeding). Heavy Nigoras tend to have more Angora characteristics, including dropped ears and heavier type "A" or "A/B" fleeces, and may be larger than Nigoras from 50% Nigerian x 50% Angora breeding. "Light Nigora": A Nigora which contains a greater proportion of Nigerian or Mini-Dairy to Angora breeding (should ideally not be more than 75% non-fiber goat to Angora breeding). Light Nigoras tend to have erect ears, lighter type "C" or "B/C" fleeces; Nigoras that have more Nigerian breeding tend to be smaller than Nigoras from 50% Nigerian, or 50% Mini-Dairy, to 50% Angora breeding. 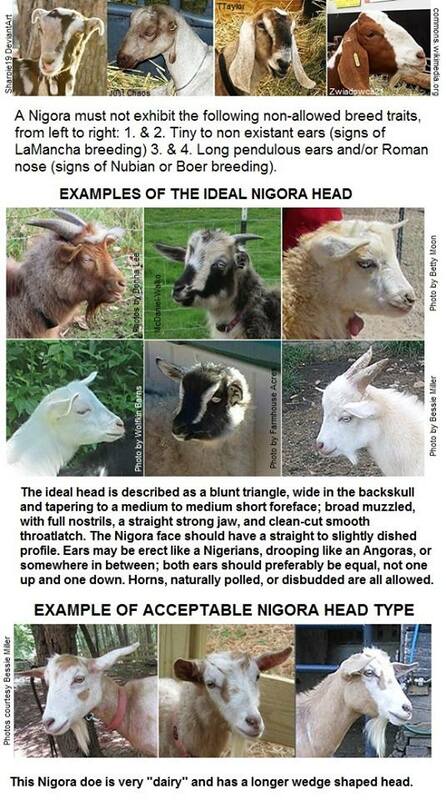 All goats applying for recognition/recordation as a Nigora must meet the ANGBA minimal Standard for general breed type and be free of disqualifiable faults and/or traits. The suggested height range for Nigoras is a minimum of 19" with a maximum of 29", measured at the withers. Goats that meet the standard, yet are over or under height, will be taken into consideration on an individual basis. (For future show purposes goats that are slightly/fractionally over or under the ideal height of 19"- 29" will receive a minor fault; goats under or over 1 1/2 inch will be disqualified.) Heights may be subject to change pending further research. Ear set may vary being erect like the Nigerians and the Swiss type Mini Dairy breeds, open and dropped like the Angora, airplane (pointy and out to the sides), or pointed and drooping; unequal ears (one up, one down) are a minor fault in show animals [future] but will not count against registration. Gopher or elf ears (a LaMancha trait) and long pendulous ears (a Nubian trait) are a disqualification for recordation/registration. Any color eyes are allowed: Gold, brown, blue, or a combination thereof. Odd eyed (one of each color) or marbled/bi-colored eyes (mixed eye color) is not faulted against. ALL colors and patterns found within the Nigerian, Angora, or Swiss type Mini Dairy breeds are allowed without preference or prejudice. Nigoras may be disbudded or remain horned by owner preference; Naturally polled Nigoras exist and are allowed by ANGBA. ''Type "A": (aka "Angora" Type) This type of fleece leans heavily toward the mohair characteristics of the Angora goat; some "Heavy" Nigoras may exhibit true mohair. ''Type "B": (aka "Blended" Type) This is the most common form of cashgora fiber, which is a combination of mohair and cashmere characteristics. ''Type "C": (aka "Cashmere" type) This fleece leans more toward cashmere fiber characteristics; some Nigoras (particularly "Light" Nigoras) may produce commercial grade cashmere. Sub-Types include "A/B" and "B/C" for fleece that fall between types. As a general rule, a Nigora should have a calm, amiable, laid back disposition and be neither aggressive nor excessively fearful when properly socialized. Website Copyright ©2006/2007-2017 ANGBA; All Rights Reserved. 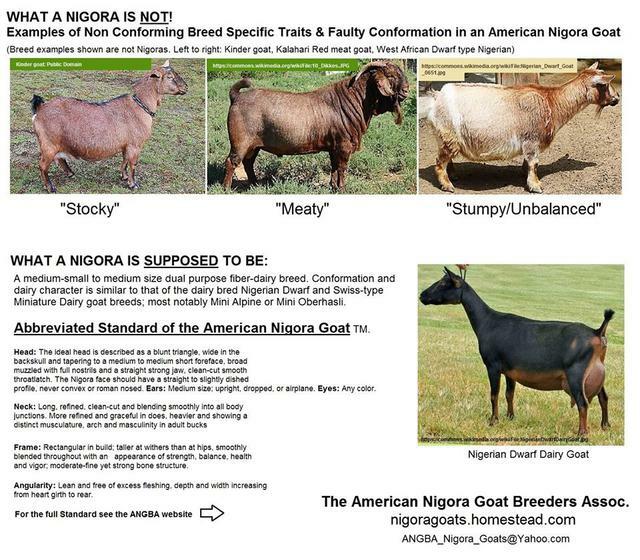 "The ANGBA Nigora Goat- An American Original"TM. The ANGBA Nigora is the first breed of goat in the U.S.A. to be bred specifically as a Fiber Producing Dairy Breed of any size. Nigoras are not a "designer" breed but are being produced to fill a need and a niche for people who are seeking to downsize or get back to basics... folks who are interested in providing for their families in an Earth-friendly, sustainable way. Nigoras were not created to be a "commercial production" goat; the Nigora's job is to fill the role of milk producer for the average family, produce a beautiful cashgora type fleece found desirable by fiber artists and handcrafters, and provide companionship to people of all ages.